Transocean Offshore, Cliffs Natural Resources, Freeport McMoRan, KBR Inc, and Array BioPharma, may be top low-price stocks worth buying in portfolios now. Check out our top stock picks for the second half of 2017. Transocean Offshore (NYSE:RIG), Cliffs Natural Resources (NYSE:CLF), Freeport McMoRan (NYSE:FCX), KBR Inc. (NYSE:KBR), and Array BioPharma (NASDAQ:ARRY) are low-price stocks with intriguing catalysts that could spark a rally in their share prices. Here's why it may make sense to add these stocks to portfolios now. When rigs aren't in use, rig companies such as Transocean Offshore have to cut their day rates to avoid losing contracts to competitors, and the one-two punch of declining rig activity and lower day rates can sink sales and profit. Last year, a decrease in utilization to 46% from 60% caused Transocean Offshore's revenue to fall to $974 million in the fourth quarter from $1.85 billion the year before. Although Transocean's sales fell last year, rebounding crude oil prices are lifting the number of active land rigs, and if oil prices continue marching higher, then oil and gas companies could boost spending on offshore projects, too. According to Baker Hughes, only 17 offshore rigs are active in North America right now. That's about the lowest in six years, but it's up from a low of 10 rigs last September. Assuming offshore rig demand climbs, then Transocean Offshore's investors could get rewarded handsomely. Before the Great Recession, this company was kicking out more than $3 billion in net income, and as recently as 2014, its share prices were more than double where they are now. If you think Donald Trump can persuade Congress to pass his $1 trillion infrastructure spending plan, then you might want to add Cliffs Natural Resources to your portfolio. Cliffs Natural Resources is the biggest provider of iron ore pellets that are used to make U.S. steel, and if infrastructure projects mandate the use of domestically produced steel, then demand for those pellets will grow. Over the past few years, prices for iron ore dropped significantly as the world's biggest producers dumped supply on the global market. However, the largest producers have become more selective in their production lately, and that's helping draw down inventory of high-iron-content ore in important markets like China. As supply falls into alignment with demand, iron ore prices are climbing. Iron ore spot prices won't go higher in a straight line, but increasing demand tied to a pick-up in U.S. steel production could get Cliffs Natural Resources back to its winning ways. Iron ore prices are climbing, and that's boosted share prices, but there could be plenty of running room left. Five years ago, Cliffs Natural Resources' earnings per share was north of $5, and its shares were trading above $45 at the time. It's not just iron ore that will be in demand if U.S. infrastructure spending spikes. Demand for copper will grow, too, and if it does, then investors will want to own Freeport McMoRan. Freeport McMoRan's management may have made an ill-timed splash into oil and gas production back in 2013, (right before spot prices tumbled), but it's been selling off non-core assets and reducing its debt, and that puts it in a much better position to profit from rising copper prices. In the fourth quarter alone, management completed $5.2 billion in asset sales, and in 2016, the company's net debt fell by $8 billion. In 2017, Freeport McMoRan expects to sell about 4.1 billion pounds of copper, and that could mean that its net income exits 2017 higher than the $351 million reported last quarter. In Q4, average realized copper prices were $2.47 per pound, and currently, high-grade copper is priced at about $2.69 per pound. Since the company's unit net cash cost for copper is expected to average $1.06 per pound this year, there's good reason to think profit is heading higher. Admittedly, Freeport McMoRan has got a big headwind in the form of a contract impasse at a major mine in Indonesia, and that could throw a wrench into its production and sales forecasts. However, I think rising copper demand, plus the potential to profit from gold and oil sales, makes this stock still a pretty good bet. KBR reported a net loss of $0.59 in the fourth quarter, but investors might not want to focus on that number. Instead, it might be more profit-friendly to consider the potential tailwinds associated with a restructuring of its business to be less reliant on lump-sum contracts, and rebounding oil and gas capital expenditures. The company is transitioning itself into a global services company that will be less reliant on fixed-price contracts, and that should help it avoid profit headwinds that it's endured in the past, including a $94 million increase in forecast costs for the completion of a downstream engineering and construction project that weighed down profit last quarter. This year, KBR expects that government revenue will offset any weakness in engineering and construction, resulting in essentially flat revenue when compared with 2016. Also, management predicts that earnings per share will be between $1.10 and $1.40. At current share prices, that means investors are only paying 13.2 times the low end of guidance to own shares. Further out, KBR's exposure to government and energy infrastructure projects could offer upside, depending on how infrastructure spending and commodity prices pan out. Shareholders could also benefit if there's substantial corporate tax reform in the United States. Donald Trump talked on the campaign trail about reducing corporate tax rates to 15%, and KBR estimates its effective tax rate will be 27% in 2017. With its shares up 31% already this year, Array BioPharma's stock is on a tear. However, if it can secure FDA approval for its new cancer drug, share prices may climb even higher. ARRY Total Return Price data by YCharts. Array BioPharma is working on binimetinib, a drug that can delay disease progression in patients who are diagnosed with a form of melanoma. In trials, patients with NRAS-mutant melanoma didn't see their disease progress for 2.8 months. That matched up favorably with the 1.6 months in patients who were given chemotherapy. About 20% of all melanoma patients have the genetic makeup binimetinib effectively targets, and there are about 76,000 people who get diagnosed with melanoma annually in the United States. Because many melanoma patients don't respond to existing treatment options, an approval could clear the way to significant sales. Most new cancer drugs are launching with annual prices north of $100,000, so similar pricing, and an addressable patient pool of about 15,000, could mean binimetinib's sales are into the nine figures. An FDA decision is expected on June 30. 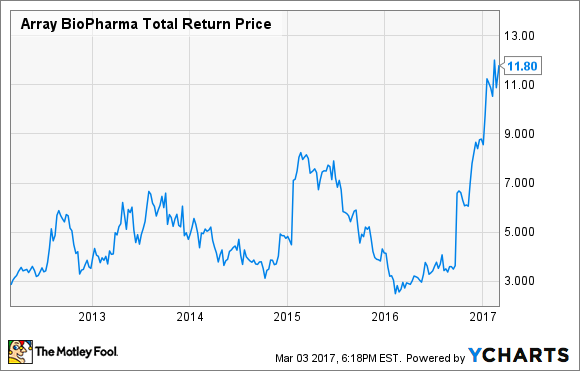 Array BioPharma's got a lot of potential, but it's admittedly a risky stock. There's no guarantee the FDA will approve binimetinib, or that any of the company's other cancer studies will succeed. Since an FDA rejection or trial failure could send its shares reeling, risk-averse investors might be better off focusing on other investment ideas.